4 years of anything in SL represents like 28 bajillion dog years (give or take), i.e., something of a mad epic achievement. Here's to that ah-ha moment 4+ years ago when our own Creamy Cooljoke breathed blog + group life into her idea of not only free finds for the inner cheapskate in all of us, but that other li'l thing that breathes life into fashion, Style. 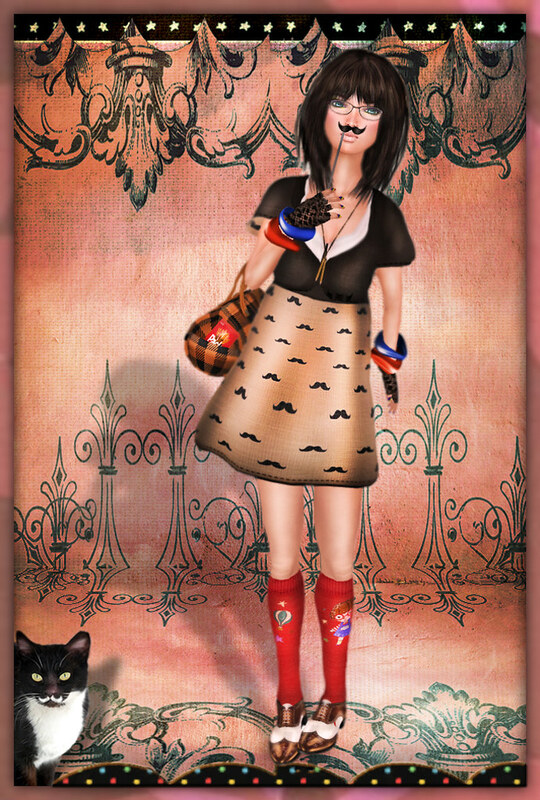 This 'stache dress is just 1 of the many discount finds at FreeStyle's 4.44.444 event; the dress is $44L + the accompanying moustache hand toy is only $4L. (Creator Katx Kirax also has a pink sherbet-striped $1L gift in-store now that even includes multi-colored nails; you can check it on her Flickr here). The Pocky-stuffed purse, knee-hi socks + lace finger gloves are all free; check the Styling Credits below for deets. It's always fun times for this frugalista to show my own style alongside our merry band o' bloggers. Don't miss this huge event that mah girls Sileny, Eden & co. have so tirelessly worked to organize + come help us celebrate many more years of FreeStyle! Frugalista fashionista love + fashionista kisses to all!